While on a very superficial level, A Head Full of Ghosts is pretty straight-forward, I'm really not sure how to review or discuss this book without getting into some spoiler territory. So, I'm going to issue a SPOILER WARNING right here and now at the outset. If you want my 100% spoiler-free review, here goes: A Head Full of Ghosts is a damn good book. Paul Tremblay crafts a terrific bit of psychological horror, with well-drawn and relateable characters that, even after finishing the book, has kept me guessing. Go read it! With that out of the way, let's dive a little bit deeper. But again, SPOILER WARNING from here on out. Tremblay manages to write a novel that can be about at least three different stories depending on your takeaway. It could be a demonic possession story, or it could be about straight-up mental illness. It could be about a family's inability to cope with their sick daughter and how the father's religious zealotry absolutely destroys them, with multiple instances of mental illness fully consuming the household and impacting the lives of everyone in this strange and peculiar home. It could be about child abuse and manipulation by the Church. It could be about a psychotic daughter. It could be about two psychotic daughters. It could be all of these things, or none of these, or maybe a mix-and-match scenario. Or it could be exactly as it is presented to us. There are no easy answers in A Head Full of Ghosts. Tremblay avoids the head-spinning trippiness of Danielewski's House of Leaves, but with the story presented as a first-person narrative, we are forced to wonder just how accurate a story we're getting. Although Marjorie is, for all intents and purposes, the "possessed" teenager, the story is constructed by her little sister, Merry. The entire book is filtered through Merry's first-person viewpoint, as she discusses her family history with a non-fiction author writing about the family's encounter with the supernatural. After their father becomes convinced that Marjorie is possessed by a demon, the family becomes the focal point of a supernatural "reality" show called The Possessed, and we get some critical examinations of these episodes in the way of intermittent blog posts. But the crux of the story is Merry and her singular accounts. We are in her head completely, and I wonder how much more of her story -- her true story -- would stand revealed in multiple readings. Can she be trusted, or is she manipulating everybody, including the reader, and to what degree? 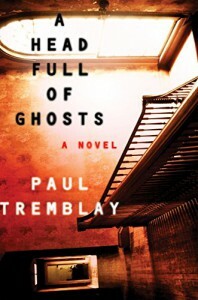 Tremblay is clearly inspired by, and clearly rather knowledgeable of the history of, possession stories in popular media, ranging from the big, bad granddaddy of them all, The Exorcist, up to Danielewski's novel, and the recent boom in exorcisms following Pope Francis' public exorcism last year. I'm very impressed in how Tremblay synthesizes and parlays it all into such a wonderful addition to the genre. He hits all the familiar beats, yet still crafts a novel that keeps you guessing even after that last page turns over. While it's difficult to embrace all of the supernatural going-ons in A Head Full of Ghosts, it's also difficult to fully dismiss them given just how successfully layered and interwoven they are in this story and with its characters. In the end, I think this book is sort of a litmus test for whatever the reader wants it to be. If you want a straight-up demonic possession story, you've got it. If you want something richer and more complicated, you can certainly find that here. Is A Head Full of Ghosts deceptively simple, or is it a Lemarchand's box of moving pieces that you could spend a good long while trying to open? That, fellow readers, may be entirely up to you.